My wife and I finally got the chance to watch Inception recently. I know, I know, we’re behind. We chatted about the movie a bit afterward, and the next day she had a pretty awesome take on what the film was about. I asked her to write up her analysis so that I could post it here to share with you guys. I know you’re already thinking tl;dr, but I think that if you are even remotely interested in the film, you should give this write-up a read. And when you’re done reading, go watch the movie again. Sorry that I am coming so late to the discussion table. My husband and I finally got the chance to watch Chris Nolan’s Inception on Thursday night. It’s Sunday and I am still thinking about it. I have gone over it and over it in my mind and have come to the conclusion that, just like everything else in this brilliant film, Cobb’s search for redemption is not what it seems. I have read several interpretations of this movie online. Some of them suggest that after watching the film, the audience should try only to understand whether Cobb’s experiences while invading other people’s dreams are real or not . Other sources argue that the movie is a metaphor for filmmaking itself. I would like to offer another analysis. Obviously, this movie is about one man’s search for redemption. But I believe the real redemption story here is much deeper, much more profound than the one we see at face value. Just as the movie is built on a structure of dreams within dreams, it is built on a story within a story. Disguised within Cobb’s story is the story of Lucifer’s plot to get back into heaven. I know what you are thinking: she is reaching; she is way over-thinking this; she is a zealot who chooses to see everything through a Christian lens. Let me just say, first, that I am not a very religious person. However, I do have a degree in Religious Studies; therefore, full disclosure, I do tend to see things through a religious lens. That being said, I do not believe that I am reaching. I do not believe that I am over-thinking this. I simply analyzed this film the same way that I teach my students to analyze a piece of literature. I looked for patterns and then made my conclusions accordingly. Here’s what I found. Although it was pure speculation, after watching the film I couldn’t help thinking that Cobb’s act of inception seemed strikingly similar to the Devil‘s act of temptation. I mean, he used inception to convince two different characters to “kill themselves” in order to escape limbo. I think an argument could be made that he “tempted” them to do it. But it wasn’t just that he seemed to be able to persuade others to sin that made me wonder if Cobb could be the Devil. Cobb reminded me of the Devil in many ways. They are both liars, they are both manipulators, and each of them has been condemned to wander in an abyss for an unspecified amount of time. But like I said, this hunch was based on pure speculation. Even I felt that it was a pretty flimsy analysis. Then I started thinking about the characters’ names. I decided to look up the meanings. What I found was a very interesting pattern, which seemed to support my crazy idea. Dom Cobb is an interesting choice for a character’s name. Dom means Lord. Cobb means supplanter. Lord Supplanter? That sounds like a pseudonym for Satan to me. But one interesting name does not constitute a pattern, so I kept looking. Do the other names seem to tell us something about the nature and function of the characters? Mal means bad or evil. No surprise there for anyone who has ever taken a Spanish class. Still, it is a name consistent with the characteristics of the Devil, which means now we have two names. I think we need at least three for a pattern, so what else has Nolan laid out for us? Well, I found that the name James also means supplanter. At this point I knew that I was onto something. The names Phillipa and James also seem to be references to the Apostles, and Miles, which means soldier, is a shortened form of Michael. Hmmm. Everyone in Cobb’s family seems to have names that are Biblical in some sense. What about the rest of his team? Arthur means noble, rock, or bear (not wholly interesting on its own, but I’ll come back to its significance in a minute). Apart from its obvious allusion to Greek mythology, the name Ariadne means holy. Eames means prosperous protector. Yusuf, a form of Joseph, means “God will add”. Oh, and Joseph happens to be the name of Christ’s earthly father. The names of the two other characters Cobb works with, Nash and Saito, don’t have Biblical meanings, but have important symbolic meanings of their own. Nash means literally “at the ash tree.” The ash tree is a symbol of sacrifice. Saito means “purification wisteria.” Wisteria is a symbol of purification and longevity. My flimsy idea was starting to have some weight. “First name? Famous Light. Last name? Fisher of men. It got really interesting when I looked up Robert Fischer, the target, and Peter Browning his godfather. I could guess at this point that Fischer would be fisherman, a possible allusion to Christ. But I found that Robert means famous brilliance. So we’ve got: First name? Famous Light. Last name? Fisher of men. Definitely sounds like a Christ reference to me. Maurice, Robert’s father’s name, means prayer. So the Fischers’ seem to have names with Biblical significance, too. And then there is Peter Browning. The fact that Peter was the Leader of the Twelve Apostle’s and was the man who established the Christian church cannot be overlooked. However, the meaning of the name Peter serves another function here as well. Peter means rock. Browning means bear. Sound familiar? That’s because Arthur’s name and Peter’s name have the same meanings. I think that this does a lot to establish them as foils. And lays some really interesting groundwork for future storylines. I think it is fair to say that there is a pattern here. Like any writer worth his literary weight in gold, Nolan did not pick these names willy-nilly. If we view Cobb as the devil, it changes the whole movie. If he is the Devil, then I think it is fair to assume that his ultimate plan is not to get back home to his kids, but to take over heaven. Nolan seems to use the characters’ names to give us insights into who the characters are and how they will function in the story. I think the name Cobb really sheds light on our protagonist’s true ambitions and desires. According to Merriam-Webster Online, the word supplanter means “to supercede by force or treachery.” I think that is the underlying story here. Cobb wants what the Devil has always wanted. He wants to be the one in charge. He is using inception to work towards this end. “Cobb wants what the Devil has always wanted. At the very beginning of the film, we see Cobb trying to extract information from Saito. The whole operation seemed like it was a flop. Maybe it wasn’t. The Cobol Corporation thought that Cobb was doing a job for them. Saito thought that he was having Cobb audition for a job. But what if this was all just a set up by Cobb? Let’s consider that inception also means beginning. Maybe this “failed” mission what just the beginning of Cobb’s plot to get back into heaven. 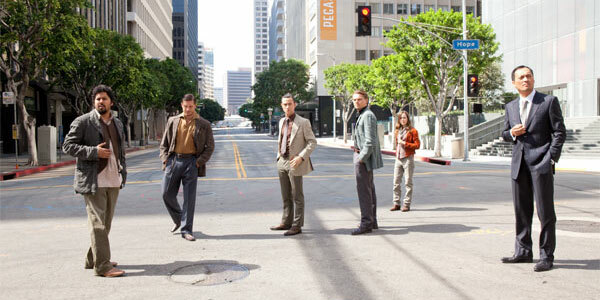 In the film, Cobb sets out to use inception to encourage Robert Fischer to turn away from his father, turn down his inheritance, and establish himself as his own man. I think there is evidence in the film that Fischer is much more than son of an energy company tycoon. There is his name, which as I mentioned earlier means fisherman. There is the symbolic importance of his totem: the pinwheel. Pinwheels are associated with innocence and childhood. If we view Fischer as a Christ figure, Cobb’s plan takes on a whole new level of meaning. I think this is the intention. I think that Cobb’s plan is to break up the relationship between Fischer and his father so that he can take over, and I believe that the reason Cobb walks away from the spinning top at the end of the movie without so much as a glance is because he is confident that the first phase of his plan has been carried out. Inception is complete. I hope that I am right because I would love to see where Nolan takes this story. UPDATE: I had Deb come on our podcast to talk a little more about this idea. Check that out here. i do not agree with your interpretation, many of the names used in occidental countries come from biblical references, that is a cultural fact, not biblical. It’s not simply the fact that the names themselves are biblical in meaning, it’s more the specific attachment of certain names to certain characters, and their overall relationships to one another that is important. Interesting interpretation. I know that Carlos said coincidence but then again at what point is coincidence more than just that. With that said I think this is the beauty of films like Inception, it comes down to the eye of beholder. So the truth is it’s meant for the people not the screen writer and every single person can make Inception have their interpretation, they can make it their film. To Carlos: I think that Nolan is the kind of filmmaker that doesn’t leave things to coincidence; he is very deliberate. That being said, I’m not sure about your interpretation of Dom’s motivation. I feel that he really loved his children, and walking away from the top at the end signified that he just didn’t care if he was in limbo or reality, as long as he could be with his kids. I will say, however, that wrong or right, you put a lot of thought into your analysis and put some new ideas out there for Internet nerds to argue about. Well done. I’ve rewatched with a more religious focus (I’m Atheist with advanced religious training, so I am always skeptical of people who see religious meaning in pop culture) and I noticed a couple of more than subtle hints that you could be on to something. Upon our first introduction to the struggle between Cobb and Mal, Cobb states that he is “Playing God”. When we see our first ‘real world’ struggle between Cobb and Saito, Saito says Cobb needs to have “a Leap of Faith”. However, I would like to disagree that Cobb is the Devil – I’m watching again to confirm this but it seems to me as though Saito is more of the Devil figure, and Cobb is just the trapped soul in hell who is forced to face the fact he murdered his wife and can only escape the bonds of hell when he repents his sins and takes responsibility for his actions. Although the movie heavily focuses on Cobb’s interactions, it’s that which isn’t shown but merely talked of that is like a magician pulling the trick. Saito is encouraging devilish acts and is trying to lurk more souls into hell as can be seen by him wanting to pull in his ‘competitor’ by making him tear apart his father’s company. Watch the film again and pay special attention to Saito and his actions and inactions. Notice how Saito plants the idea in Cobb’s head that he could pull off the inception; Saito shows up the very moment Cobb is in trouble and pulls him to safety; Saito arranges for alternate flight arrangements for his competitor allowing Cobb to do the inception; Saito manipulates Cobb to believe he can get home safely; Saito arranges for Cobb to get passed US Border Control and Immigration. Although it appears that Cobb is calling the shots, it is really Saito who is moving things forward.